I don’t know where the original recipe for this dish came from but it tastes good. The quantities quoted are what I used tonight. I served it with carrots though a salad would also be good. It is also delicious cold. Heat the oil in a large pan and gently fry the onion. Once the onion is starting to go translucent add the chopped courgette and cook until the courgette has softened. Add the spinach and cook until wilted. 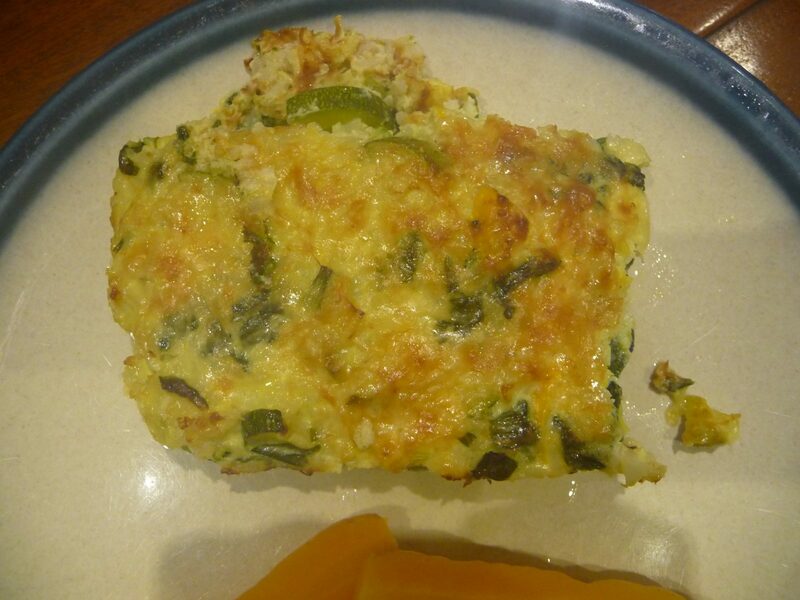 Remove the pan from the heat and add the rice, cheddar cheese, pepper and eggs. Mix well before pouring into a greased, shallow oven proof dish. Sprinkle the parmesan cheese over the top. Bake in a preheated oven at 200°C/ Gas Mark 6 for 30 minutes or until the top is golden brown.